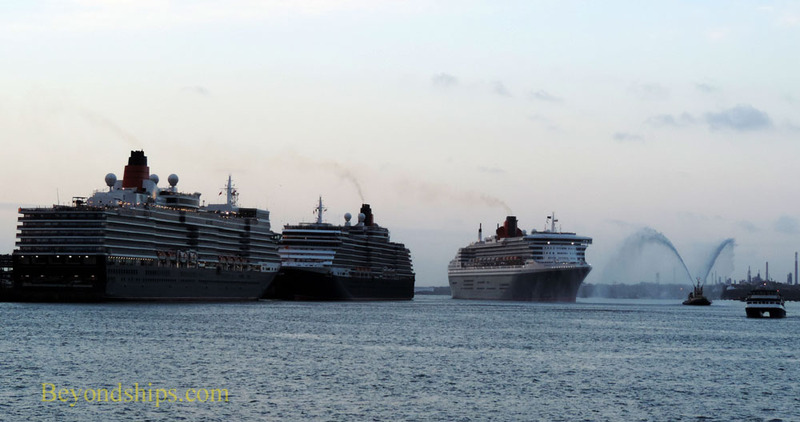 On 9 May 2014, the Cunard Line fleet arrived in Southampton, England for a celebration of the tenth anniversary of Queen Mary 2's entry into service and becoming Cunard's flagship. QM2 is the most famous passenger ship currently in service and has played host to world leaders, celebrities and some 1.3 million passengers. The celebration that took place in Southampton involved not only the three Cunard queens but also royalty, members of the armed forces, as well as numerous spectators ashore and on boats. There was maneuvering by the ships, musical concerts and a massive fireworks display. As QM2 Entertainment Director Paul O'Loughlin said: "No one does a celebration like Cunard." The celebration began before dawn. The three Cunarders had gathered a few days before in Lisbon, Portugal and had sailed to England together. Arriving off the Isle of Wight in the early morning hours, the ships proceeded up the Solent and Southampton Water to the harbor. The first ship to arrive was the newest ship in the fleet, Queen Elizabeth. (See separate story on why this ship is not called "QE3"). The Elizabeth executed a 180 degree turn near the Queen Elizabeth II Terminal where she was scheduled to berth. However, she did not go to her berth but rather took up a position further down the pier. Next to arrive was Queen Elizabeth's near sister, Queen Victoria. 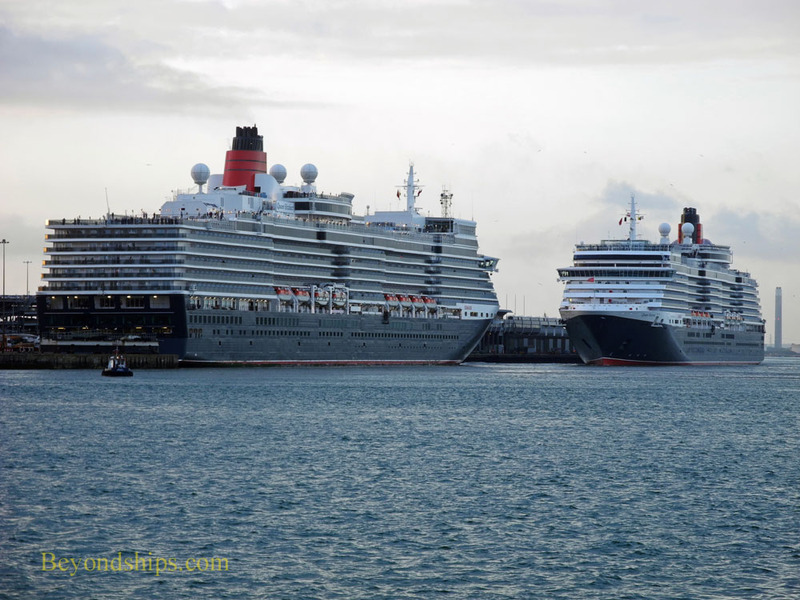 Although she was scheduled to dock at the City Terminal further down the harbor, Queen Victoria pulled into the berth by the Queen Elizabeth II Terminal. As a result, she was bow-to-bow with Queen Elizabeth. This set the stage for the arrival of the guest of honor, Queen Mary 2. 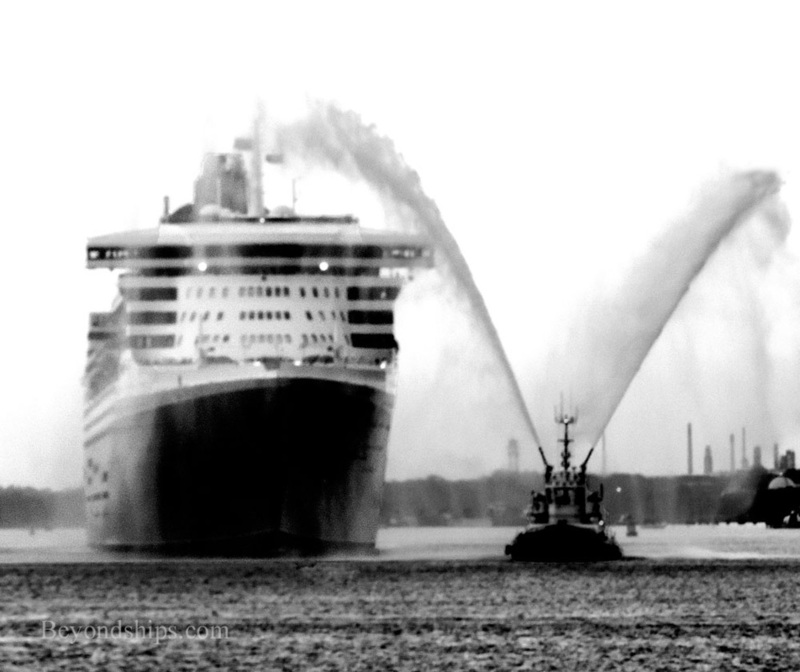 Preceded by a fire boat, which shot arcs of water into the sky, QM2 proceeded majestically by her fleetmates. Horns sounded in salute. Indeed, the two smaller Cunarders played "Happy Birthday" on their horns. 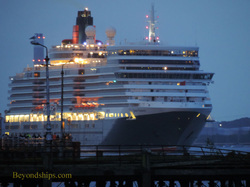 QM2 then turned and entered the slip at the Ocean Terminal where she was to spend the day. 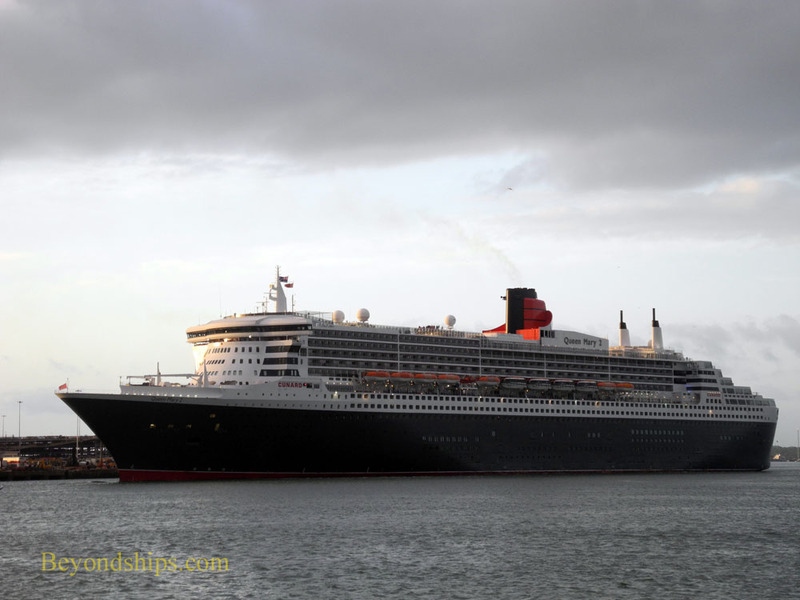 Once Queen Mary 2 was in her berth, Queen Victoria pushed off from the Queen Elizabeth II Terminal and proceeded down through the harbor to her berth at the City Terminal. This allowed Queen Elizabeth to move forward and dock beside the Queen Elizabeth II Terminal. 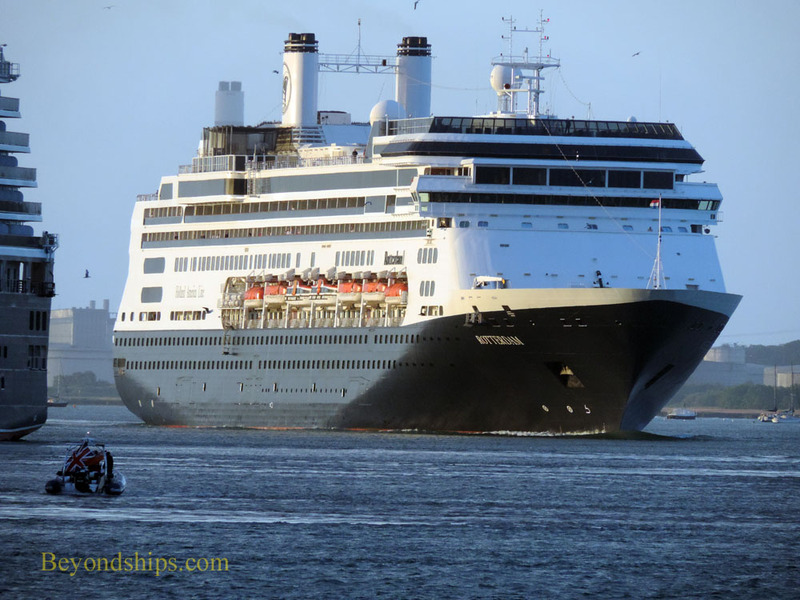 Also in Southampton on 9 May were Holland America's Rotterdam and P&O Cruises' Arcadia. Rotterdam made only a brief appearance, arriving after the Cunarders and leaving at mid-day. Arcadia did not stay for the entire party either. 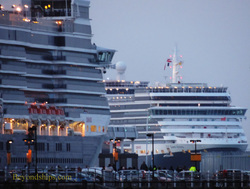 The first to arrive, she spent the day at the far end of the harbor at the Mayflower Terminal. Towards evening, she cast off and sounded her horns in salute as she passed by QM 2. It can be argued that the presence of Arcadia at the celebration made this event more historic than the past gatherings of Cunard queens. Only three ships participated in each of the previous gatherings. 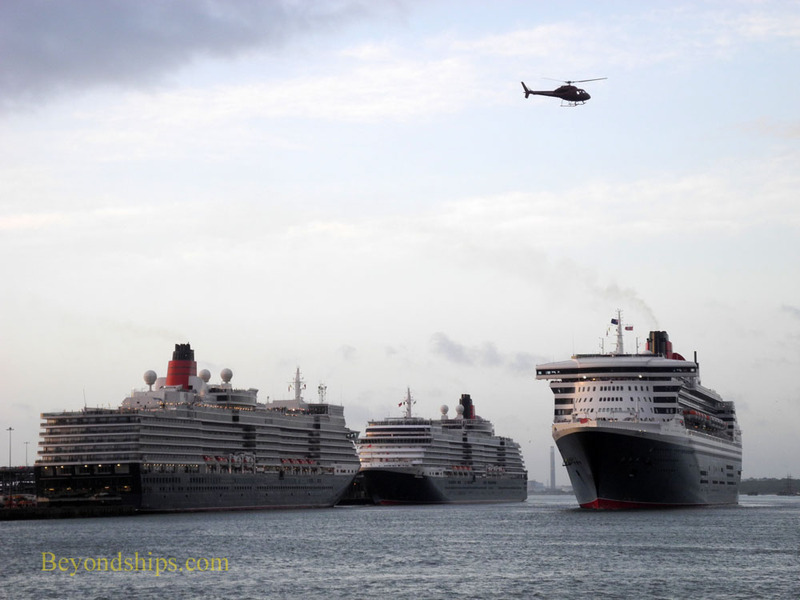 (e.g., QE2, QM2, and Queen Victoria in 2007; QM2, Queen Victoria and Queen Elizabeth in 2011 and in 2012). Although only three ships flew the Cunard house flag this time, there were four ships in the harbor which at one time or another were Cuanrd queens. (See separate story).